We often have the idea that God is looking for people with an impressive spiritual resume—men and women who meet all the qualifications. We think if God is seeking people to serve Him, He will look for the most qualified, the smartest, the bravest. The truth is, God doesn't look for eloquence—He looks for emptiness. In Acts 6, the newfound church had exploded into existence and discovered their first problem: they had a great deal of money! All of its members were selling their land and possessions to give to the needs of others, but some of the widows in dire circumstances were being overlooked. The Holy Spirit moved the apostles' hearts to choose seven men to solve the problem. That job seems easy enough, doesn't it? If I were one of the apostles, I would have called for the accountants in the church, the financiers, the treasurers, the bookkeepers—those who had experience with handling and dispersing funds. That would seem the logical choice, wouldn't it? But the apostles had different criteria. In Acts 6:3 we find the qualifications: "Therefore, brethren, select from among you seven men of good reputation, full of the Spirit and of wisdom, whom we may put in charge of this task." Wow! The implication here is that the men who were selected were men devoid of themselves, having been filled with the Holy Spirit. They were wise because they were surrendered to God, and because of this, God chose them for the task. Can you guess what happened next? The matter was settled and the widows were taken care of from that day forth. God doesn't need the best-of-the-best to change the world; He can do it all by Himself. Yet, in His mercy and love, He has decided to allow us the opportunity to leave a mark on our sphere of influence for His glory. So be encouraged, friend; you don't have to be the best-looking, the smartest, or the most talented person in the world to gain God's approval. When Jesus Christ chose twelve men to be His closest companions, He didn't go into the rabbinical schools to find the most brilliant graduates. He chose instead twelve unlearned men who were nobodies in the religious world's estimation. Why? He wasn't looking for impressive resumes. Today Christ seeks out men and women who are both dependent upon and available to the Holy Spirit for His enabling. He's looking for people who know they don't deserve the credit... have you updated your resume? Prayer Point: Lay your heart before God at this moment and ask Him to show you the prideful things you should rid from your life. Pray that He will empty you of that pride and give you faith to rely fully on Him. Extra Refreshment: Read the entire chapter of 1 Corinthians 1. There is only one giant on the battlefield in 1 Samuel chapter 17, and his name isn’t Goliath; it’s David. In this unforgettable encounter, David reminds us why great faith in a great God leads to great victory. 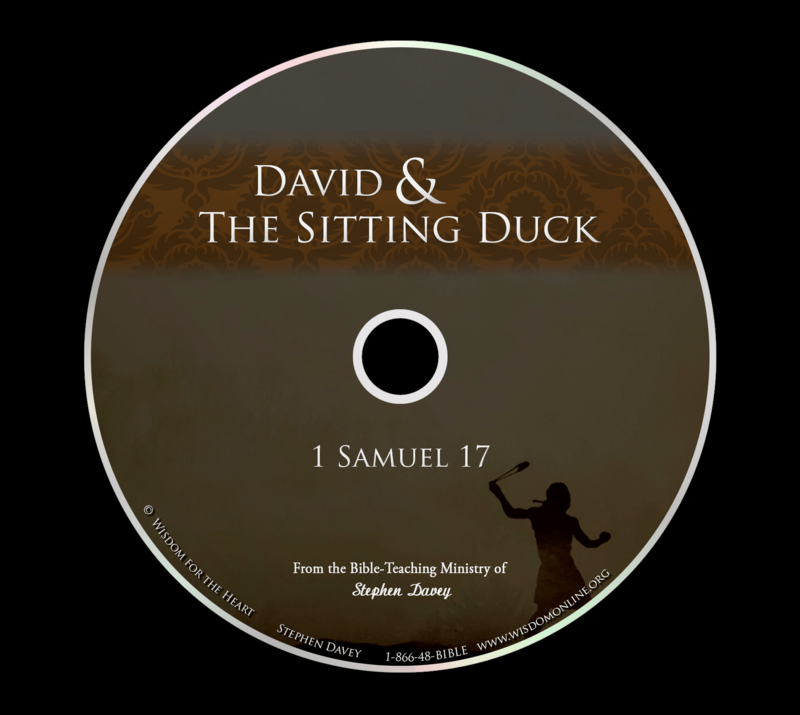 Receive this CD as a thank you for any size donation this month! we’re committed to expounding on Scripture and illustrating with life!